Not a footy score between a couple of non-league teams but the number of visits I made to each birding area one week in mid-September, a summary below. Three visits to Spurn. 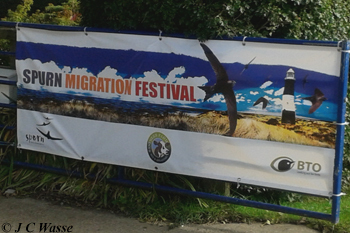 Attended the Spurn Migration Festival (Migfest) on the Saturday, a day of persistent rain. Birding a little slow but the diminutive Kentish Plover at Kilnsea Wetlands was a big draw, a good Yorkshire tick for me and many others, and the first in the Spurn area for over a decade. 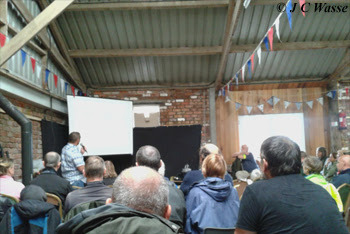 The Mig Fest was well organised and well attended and looking round the fantastic displays at the Westmere Farm base and meeting up with folk took the mind off the bad weather. The talks in the day and evening lecture were top class. Fascinating to hear about Cellular Tracking Technologies being used across the Pond to track bird movements and the potential for using miniature tracking devices on smaller species (Michael Lanzone). The evening lecture 'A Tale of Two Peninsulas' was well entertaining and informative. Even though I've been to Cape May nigh on 20 times I'm still learning about the place, and got a good answer was forthcoming as to where the blooming Route 9 Cattle Egrets disappear to on World Series of Birding day! Happy to talk on and on about Cape May to the cows come home, here's a taster, check out my trip reports from both Spring and Autumn and a couple of recent birding videos. 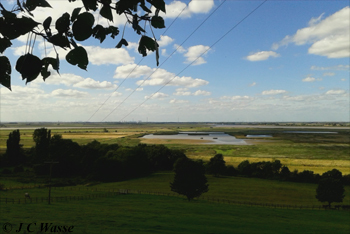 Falsterbo has always been described to me as a bit like Cape May, would like to visit one day to see the raptor migration spectacle. Nice to have a side by side comparison with the NJ counterpart,The lecturers David La Puma and Bjorn Malmhagen from Cape May and Falsterbo respectively, surely The Two Ronnie's of the birding world! Good to catch up with the Spurn folk from Wath days of old, plus friends from Cape May. Hope they enjoyed the Yorkshire hot spot and cemented the formal Friendship Agreement of the three Capes. 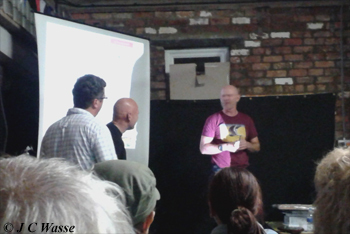 Cheers to all who made the event a continuing success and especially to Andy R for signing a copy of his cracking book - Birds of Spurn. Visited Spurn on the following Wednesday and Friday. The least said about the latter, let's say I'm sticking to Tetley and Yorkshire Tea, not the one beginning with 'P'. The former was more enjoyable as friends Ruth and Mark from Rainham were in town, birded Kilnsea and down to the Chalk Bank with them. Nowt moving passerine wise, but we had cracking views of a Merlin at Kilnsea Wetlands, it spooked the long staying Wood Sandpiper, and a brief Hobby flew past the nearby radar dish. Six visits to the 'Wath Area' only a few miles from home. Highlights included loads of Little Egrets at both Broomhill Flash and Old Moor RSPB plus 3 Garganey glued together, Wood Sandpiper, Greenshank, Ruff, cc Marsh Harriers and a marauding Hobby. The near resident Green Sandpipers always good value! Interesting spread of temperatures as low as mid teens on some visits at the end of week but one day mid week it was touching blooming 30! 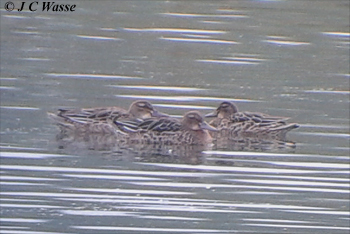 Birded the area with my dad and saw a nice variety of resident and passage birds. One day saw a strong southerly movement of Swallows, one of which evaded a lightening strike by a Merlin. A probable Hobby too distant to clinch in a dogfight with a Kestrel and another visit produced a Peregrine tracking a Buzzard over woodland before gliding away into the ether. Kestrels were numerous throughout as were Buzzards, and one day at the end of the week saw a noticeable appearance of Sparrowhawks, 3 over one hillside. 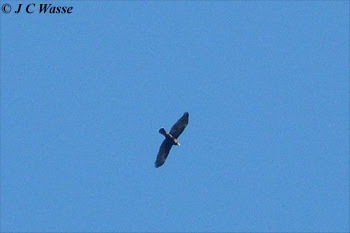 Raven sightings on all visits and a passage Marsh Harrier added to the variety on the Sunday (18th), it was moving through very very high up! Mistle Thrushes flocking, Meadow Pipits calling overhead and a flock of Wigeon through were signs of autumn. 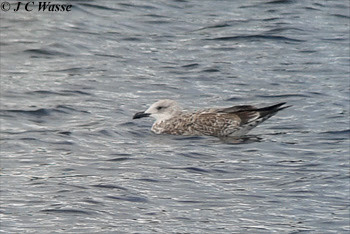 Nearby on the upland edge an immature Yellow-legged Gull tried to hide itself amongst a flock of LBB Gulls at Ingbirchworth Res. and a pair of Little Owls sunbathed at one location as a cycle race passed along the criss-crossing country lanes. Caught up with Baird's and Pectoral Sandpipers at Hatfield Moors, South Yorkshire, the former another Yorkshire tick of this trip back home. 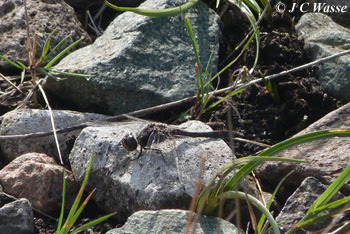 A Peregrine flew over and Black Darter dragonflies along the track to Packards were new for me. Relatively close by was Alkborough and it's attendant Western Swamphen. It showed briefly at distance from the Horse Paddock with up to 7 Spoonbills frequenting the main pool. 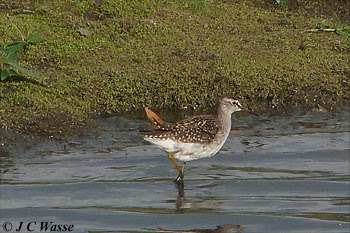 More photos at 'Latest UK Bird Photos'. Please enjoy.